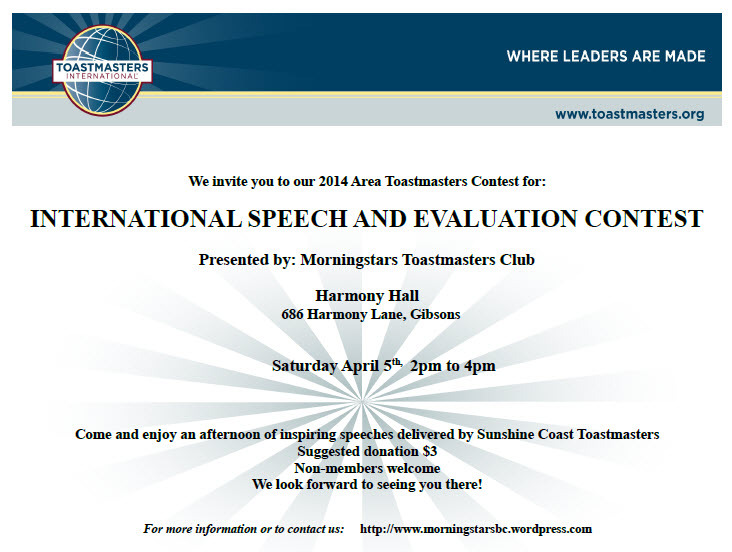 On Saturday, Feb 23, toastmasters from all four clubs on the Sunshine Coast gathered for the Area contest. Winners from the contests at the club level participated in the Area Contest Level. Two contests were held, the International Speech Contest, and the Evaluation Contest. The contest was ably chaired by Sandy Wrightman, president of Morningstars. All speeches were timed by our two expert timers, Kate and Sue. Here are our speech contest winners. First place Shawna (centre) will proceed to the Division Level Contest. First place winner Shawna being congratulated by our Area Director, Debra Taylor. Here are the evaluation contest winners. First place Andrew (centre) is eligible to advance to the Division contest. Eleanor Kroeger, District 96 Director, (right) was present and delivered the test speech for the contest. Congratulations to the winners, and thanks to all the helpers who made the contest possible. Today is the morning after the most recent Morningstars Toastmaster’s meeting. Many thanks to Judy Lynne for chairing the meeting so early in her Toastmaster’s journey. She received her Icebreaker pin today, and is well on her way for her next speeches. Her Icebreaker speech a few weeks ago continues to resonate for many of us in the club. Her message about encouraging local youth to participate in Outward Bound opportunities is a result of her sharing her life’s work with others after the death of her son. Judy Lynne personifies authenticity as she crafts her speeches for clarity and purpose. PJ’s evaluation of my fourth project in the Advanced Storytelling manual was encouraging, especially because I experienced difficulty staying in the emotions of empathy and concern which I had planned and prepared to deliver as a key part of the project. Reflecting on how this unfolded at the meeting, I learned that telling the story in the third person rather than first has the potential effect of losing touch with my own inner direction or grounding (as Katherine referred to in her speech that followed mine). Katherine shared the highlights of the workshop that she will be c0-presenting at the Chamber of Commerce event next week. Using a visual display and body gestures effectively, she captured our interest in signing up for the workshop. 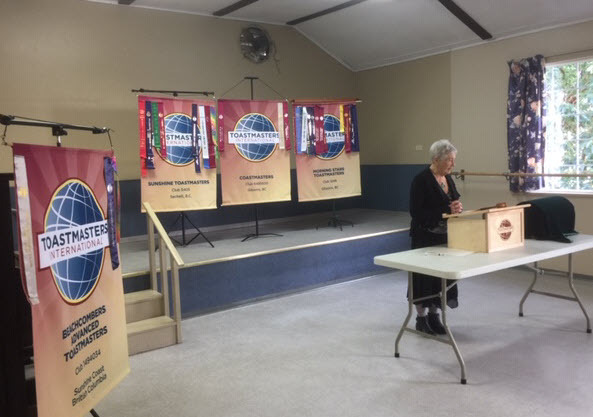 Katherine’s Toastmaster’s knowledge and voice coaching background shone through her presentation to us, and was a model of “practice what you teach”. Both speeches from Advanced Manuals prove that as we follow the guidance from the speech manuals and apply it to real life situations, much personal development is achieved over time. 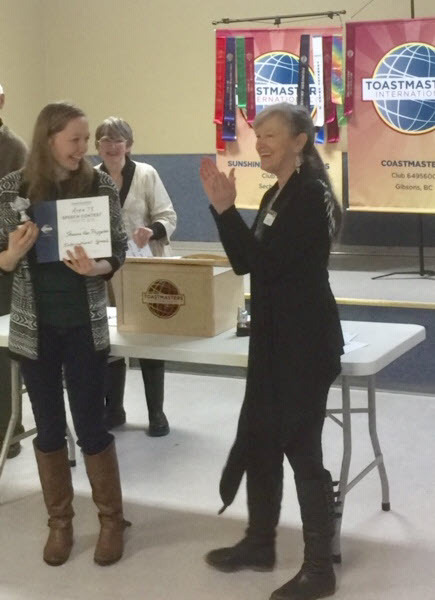 As I look forward to the rest of the week, and our International Speech Contest at our next meeting, I once again recognize how supportive our club is and how, with each project or role we take on at each meeting, we grow in our speaking confidence and our ability to understand each others’ progress. As Loretta declared in her toast to nature (our theme for the day was “Lessons from Nature”), we are all connected and we each have unique messages to contribute to a thriving Coastal Morningstars Club. The theme, tone and feeling of the day was We Remember. Larry, our Chair for the day, managed the meeting with grace and humour. Pj is off for two months to Mexico, so lest he forget, we presented him with his pins for his Competent Leadership and Competent Communicator awards. Frank as Inspirator gave a moving toast on gratitude to our veterans, and the remembrances celebrated all across the country yesterday for Nov 11. Patricia, our Grammarian, to fit with our theme, chose reverence as the word of the day. It was also a day for testing our abilities for impromptu speaking. Not knowing until the last minute which one of five different topics she would be speaking on was the challenge for Katherine. To speak off the cuff is an exercise in trust and staying present. And Jolanda, who is one of our newest members, in the spirit of jumping in gave her Icebreaker speech in place of a cancellation. Well done, Jolanda! 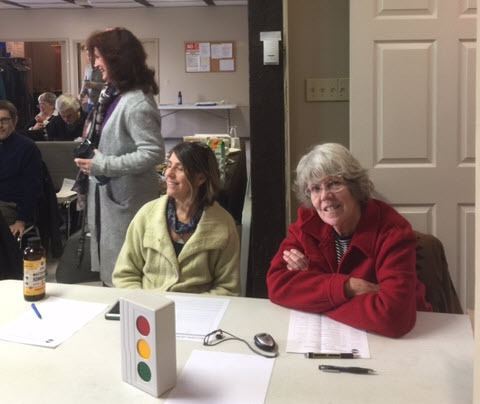 Cathie, our Timer, took some liberties with John McCrae’s poem, In Flanders Fields, to remind us that as Toastmasters we have to keep to the time allotted to us for each role or speech. She does not hesitate to ring the bell, our signal to stop talking now! Table Topics was ably done by David, although he didn’t fare quite so well with the Jokemaster role. He was assisted in delivering the punchline by Sharon, and received a huge round of applause and much laughter. Sometimes the unexpected is much funnier than what was intended. Johanna, Kate, Greg, PJ, and Ben assisted with the other roles to round out the meeting. The theme for the next meeting is WHAT I CAN’T BELIEVE. This weekend, while playing disc golf with Steve Pavlina, author of Self Development for Smart People, we started talking about the longevity of our speaking careers. He said that when he started, he treated speaking as a presentation or a performance, which put up a wall between himself and the audience. He often felt that he had to impress them, to build rapport, and to win them over. At that time, Steve said, he focused on content and delivery, his primary tools for engaging with a room full of strangers. Great insight. Forty-seven years to earn a DTM (Distinguished Toastmaster)? 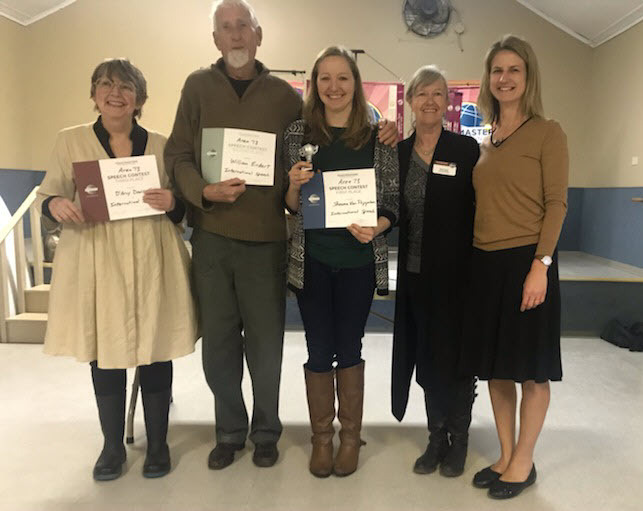 It was a proud moment to receive recognition yesterday morning for this rather noteworthy achievement, having first joined Toastmasters in Vernon, Club 1929 in September 1967. As I mentioned in my acceptance, I have seen many changes in these years. My first manual, called Basic Training, was similar to our Competent Communicator manual but focused on rather mechanical yet effective “how-to’s” of Public Speaking and Robert’s Rules of Order. Significant of the day was that Toastmasters was an all-men’s organization. The Advanced Manual was simply another 10 speeches. Through the next 30 years, Toastmasters saw many changes: improved materials and designations were accompanied by opening the doors to women. The basic concept of Ralph Smedley has remained the same although the introduction of the leadership track and the “Better Listening et al” has given way to the focus on Becoming Leaders. This has enriched the program immeasurably. The last 15 years of my Toastmasters experience have been the richest. 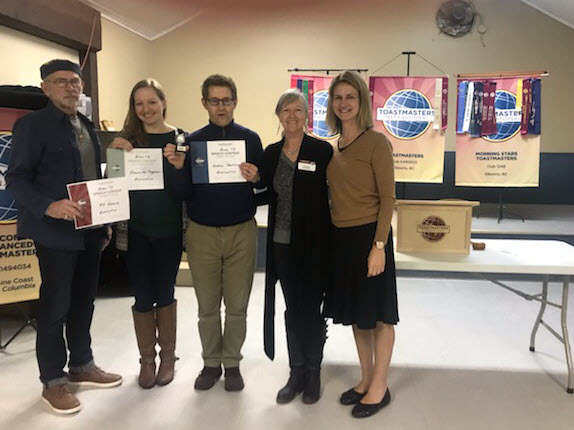 Overlander Toastmasters Club in Kamloops, Advanced Speaker’s Klub in Vancouver and Morning Stars Club here in Gibsons have all enriched my life in ways beyond adequate description. With the encouragement of so many, it became clear that always ‘starting over’ with the latest materials was a valuable pursuit. Today, I thank all Toastmasters who have kept that encouragement alive. I extend special thanks to Patricia who challenged me and provided a model of focus. She also yesterday nailed it when she described the awards as the ‘harvest’ for the period of sowing and tilling. Yet, like the Buddhist notion of achieving enlightenment which requires ‘chopping wood and hauling water’, it (like our achievement in Toastmasters) follows that when enlightened, one should ‘chop more wood and haul more water’. Thank you Morning Stars….still chopping wood. Last Saturday I was at the Area 73 Speech Contest. This was the first contest where I stayed from the beginning to the end. I stayed extra long after the meeting to eat a delicious Nanaimo bar and some other things. It was good to see Judyth running the meeting. It was first time for me to see her interviewing people in a official capacity and I enjoyed seeing her in a new role. Two of the four speeches were unfamiliar to me so I was particularly interested. Bill added some new inspiration element in his speech and I liked it. Bubbly Sharon talked about saving energy. Two other speakers, Kate and Paula, came from other clubs on the coast. Personally I wanted to hear some other great speakers that I recall from the past contests but I guess they played judge roles and I highly appreciate them for doing that. Of course the main thing for me was doing the test speech. Four speakers spent 2-3 mins each giving me very valuable feedback. This was helpful to understand what each evaluator was telling me. One thing I remember well is what the Evaluation Contest winner Sandy said about “telling the listener what’s in it for them”. Other reviewers generally told me that my speech content is not easy to follow. They all gave me some practical suggestion to try to improve the clarity of my ideas. Thanks to this great feedback system I am extra excited to deliver new speeches! It was exciting to deliver speeches to a new audience. With more practice, we might start feeling like speaking to a family member over a ho-hum dinner! Overall it was great to have almost two meetings in a week to get twice as much out of the week in terms of public speaking. Congratulations to the winners who now move on to the Division Contest in Vancouver on Apr 19. Click image to enlarge for details. Join us Sat Apr 5th for our area competition.